On the day after the wedding festivities, my boyfriend A and I took it pretty easy. We had breakfast hosted by my brother-in-law D's family. As D and my sister L headed out to Martha's Vineyard for a few days of rest, A and I went to check out the beach. After our long walk, we came home to leftovers of cheese and cake from the wedding. 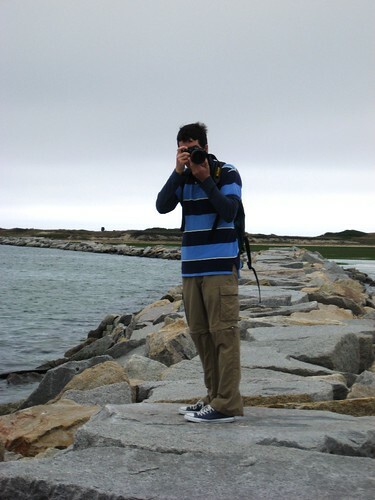 A on the jetty in Provincetown. While A napped after our long walk, I researched restaurants in Cape Cod. I narrowed them down to a couple. I let A make the final decision since he faces less choices because he's vegetarian. We decided to go to the Nauset Beach Club. 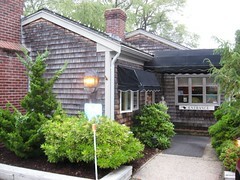 The Nauset Beach Club specializes in Northern Italian cuisine and is set in an old converted beach house. 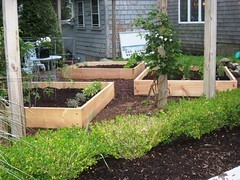 By the parking lot, I spotted a garden that I assume supplies the kitchen. I think that's a good sign for a restaurant! The garden and Beach Club! We were first served two pieces of bread with sage flavoured oil. 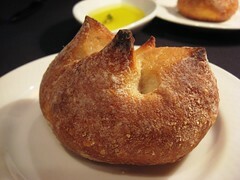 I remember really enjoying the hot bread (because it was a foggy and cold evening), especially dipped in the sage oil. 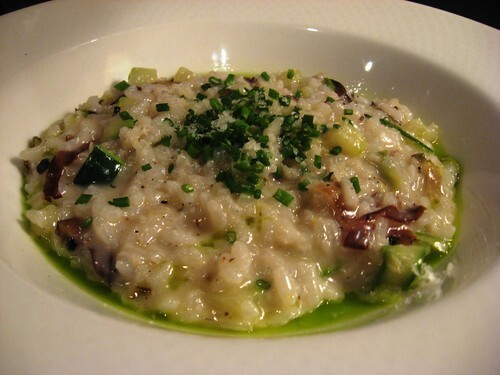 And I decided to share a starter and picked the risotto del giorno: grilled radicchio with shaved asparagus. It was very good and I really liked the unusual use of radicchio in the risotto. 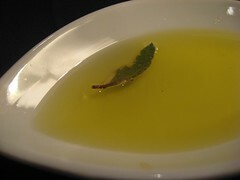 Top: bread and sage oil. Bottom: risotto with radicchio. For my main dish, I ordered the linguine con vongole ($13 for the antipasto portion) since I figured clams in Cape Cod would be quite fresh. 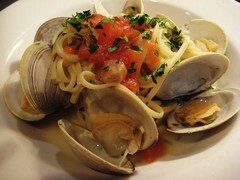 This dish was very simple and depended on the freshness of the clams. 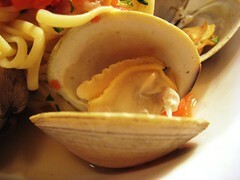 The little neck clams were great but the sauce lacked a bit of excitement. With our main dishes, I decided to order a contorni. 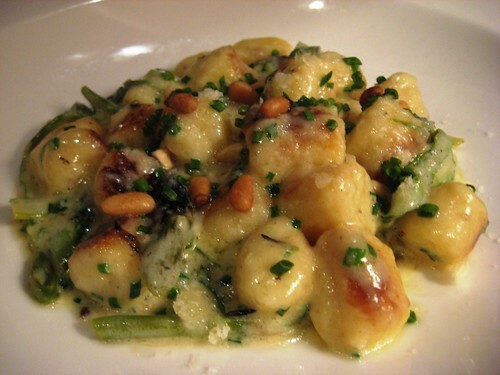 The verdure ($6) I selected consisted of escarole with garlic and carona beans and tomato confit. It was a great choice! With my Asian background, I love eating cooked greens. The dish might not look spectacular but I loved the creamy beans and the tomato confit was perfectly flavourful. 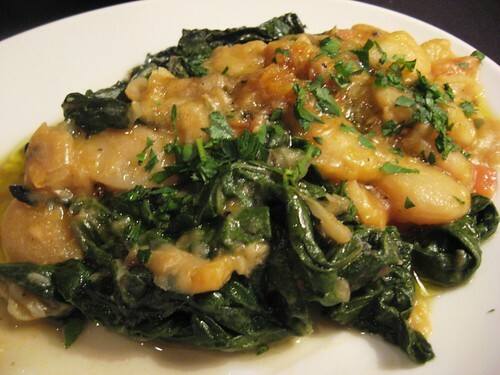 Anyone would eat greens if they were served this dish. I have been obsessively searching the internet for a recipe to replicate! Escarole with garlic and carona beans and tomato confit. One thing I noticed going out for dinner with A is that he encourages to stop eating when I'm full, while I'm happy to plow through sometimes. The result is that when we go for nice meals, we usually skip dessert since we are pretty full at the end of our meal. But come to think of it, I think I'd rather have a nice appetizer than dessert. If you're looking for a nice Italian restaurant in Cape Cod, or a good restaurant in general, I really think we picked a winner!